Simple and easy to make baby corn stir fry is indeed a borrow from China to India and became one unique part of our Indo Chinese recipes. Don't you think so? Baby Corn is my all time favorite. I still remember every week asking my dad to take us to a hotel by name Raj Residency and force him to order Babycorn masala with Butter Naan.. Good old days.. I was in 5th class then. Babycorn masala was my favorite and bothered my mom to the core just to make Baby corn masala. But my mom answered that she doesn't know how to. Time flew.. you have many more tag lines added to Baby corn.. but those memories last long forever.. I frequently visit Vizag and went to that place were Raj residency was situated... bad luck... its no longer there.... I have to cherish the memories of that yummy babycorn masala close to me and find out something to recreate the taste. Coming back from embraced memories. 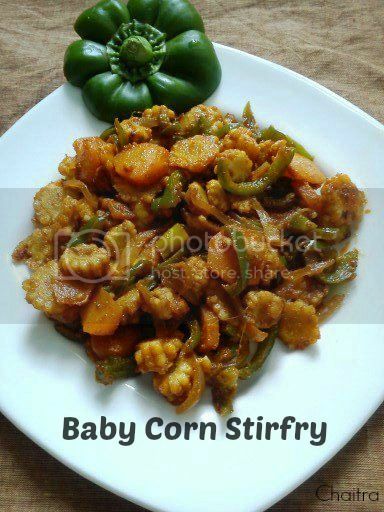 I am presenting simple and delicate recipe.. Babycorn Stir Fry. My recipe is more Indi indi recipe where you will find traces of Chinese but more inclined towards Desi, If i can call so. Perfectly matches with plain rice and also with Jeera rice or Ghee rice or Butter rice. Cut each baby corn into 2 or 3 pieces based on its length. Put them in a bowl of water and throw a pinch of salt and turmeric powder and bring them to a boil. Off the flame and remove them from water and put them on a plate. Heat oil in a frying pan, add jeera or cumin seeds until they splutter and then add chopped onions and fry until translucent. Add capsicum and carrots and cook for 2-3 mins. Add the boiled baby corn pieces and combine all the veggies by adding salt and the sauces. Throw in the spice powders and then mix the ingredients. Cover it with a lid so that the veggies absorb the masalas and sauces. After 2-3 mins, remove the lid and then fry the entire mixture until slight crisp for about 4-5 mins. Ensure that you keep stirring this mixture occasionally to prevent scorching. That's it.. You are done and now pair it up with plain rice... Eureka.... You have a satisfying meal. Yes...the post header confuses you.....and relating these terms can give your brain a run. I am sure of that. These days I am bit occupied with loads of projects, that my blog baby couldn't get her space and so was my interest in cooking. 58 hours was my total working,last week and I couldn't get time to cook up. Hunger pangs were common along with some skipping of meals and when I found out last Friday that I badly wanted to eat something real solid without having to grease my hands....yippie... 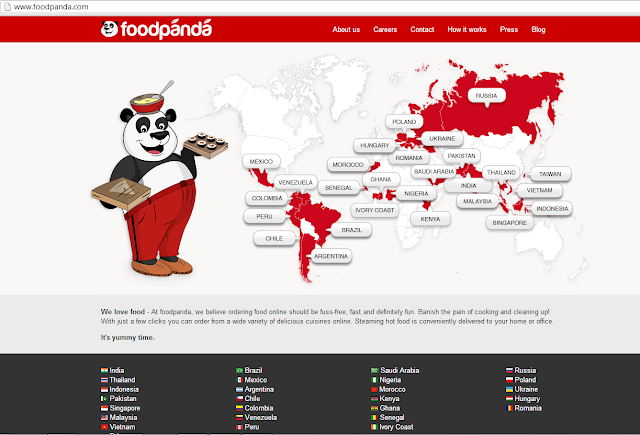 I googled...I sat for 10 mins and a Panda came to my rescue and satiated my craving.. This is not the Panda on WWF logo or the ones we find in forests.. This Panda loves food and satisfies human hunger.. This is a sweet Food Panda and here you can take a shot of him. 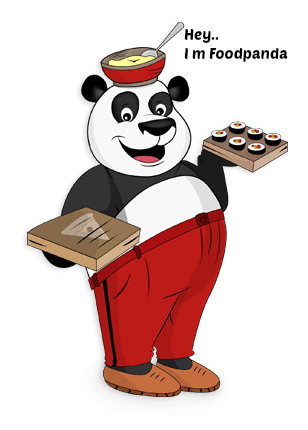 Well....let me brief you guys that Food Panda is a problem solving hunger team who thought a lot and came up with this concept to satiate human hunger along with quenching the thirst for taste. This energetic team operates in 27 countries across the globe and seriously believe that food ordering should be fun and fuss free with which we totally agree with... Right? I don't like waiting to pass over the IVR just to place my order... This concept of Food Panda is unique and they promised to deliver what they believed in..Yes, it is fuss free as I checked it out myself before sneaking it out to you guys. All you need to is just go to their website...select your locality and get the list of your favorite restaurants. Keep your eyes hooked to the lavish spread of menu which stacks right from simple soup to something real regional cuisine like Hyderabadi..or you can treat yourself with those yummy Lasagnas, burritos, cakes, pizzas and this list goes never ending. Thumbs up to you Food Panda team for keeping the price and quantity on the site which will keep the visitors or hunger stricken homo sapiens like me coming back to you without hurting the pockets and at the same time enjoy their food. After selecting I ordered my food over chat. The chat associate was very courteous.. Don't know if it was a male or female chatting at the other end.. as all I could see was customer service on my chat window... :p.
They suggested me few combinations when I was ordering Ala carte and helped me save on my bill and I like their efficient service and also their concept which is a boon to nuclear families, working class immigrants, students and working couples. I got my food delivered in 28 mins and yippie i din't even bother to grab a plate.. That's it... everything was sorted out it in a jiffy and I loved it.. Tiring and graveyard shifts do not bother me or my kitchen.. You know that there is a Panda who loves you a lot and will come for rescue. I would highly recommend this service to my friends and my fellow bloggers. You will truly love it.. The chat feature helps you understand their concept and how it works apart from ordering food of your choice.